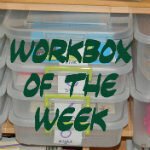 Another easy and fun workbox activity is to get some colored pipe cleaners and have your child string colored beads or buttons of the same color. I always choose colors I know Margaret will like. She really seems to enjoy this activity.